Never overload electrical circuits with Christmas lighting. Never burn candles near decorations or “live/cut” trees and never leave a candle burning unattended. Make sure your tree does not block an exit point from your home. If you have a “live/cut” tree, make sure it is watered regularly. If its dry and the needles are brittle, remove the tree from the home. Make sure your oven is clean before cooking Christmas dinner and never leave cooking unattended. Keep pot holders and lids handy, and never throw water on a grease fire. Cooking fires are still the number one cause of residential fires. When hanging stockings or other decorations over a fire place, be sure to keep them far enough away so they do not ignite. Make sure lights used outdoors are rated for OUTDOOR use. Keep your chimney clean and have it inspected at least annually and make sure your roof gutters are clear of combustibles such as leaves and dead tree branches. Make sure you always use a screen in front of wood burning fire places. Keep combustibles away from all sources of heat and flame such as the main heater, hot water heater, or other auxiliary heating sources. Kerosene heaters, while not as common as in the past, CANNOT be used in multifamily dwellings such Condo’s, Townhouses, and Apartments. If you still use a Kerosene heater as an alternate heat source in a single family home be sure the area is well ventilated, combustibles are clear, and small children stay clear. Have your heating company check your flue and heater every year to make sure its working properly and dangerous Carbon Monoxide is not being emitted into the house. If you didn’t change you battery in your smoke detectors when you changed your clock, it’s not too late. Make sure you have a working smoke detector on every floor of the home and near sleeping areas. Make sure you have a working Carbon Monoxide (CO) detector as well. Smoke detectors, CO detectors, and home fire extinguishers make great Christmas gifts. 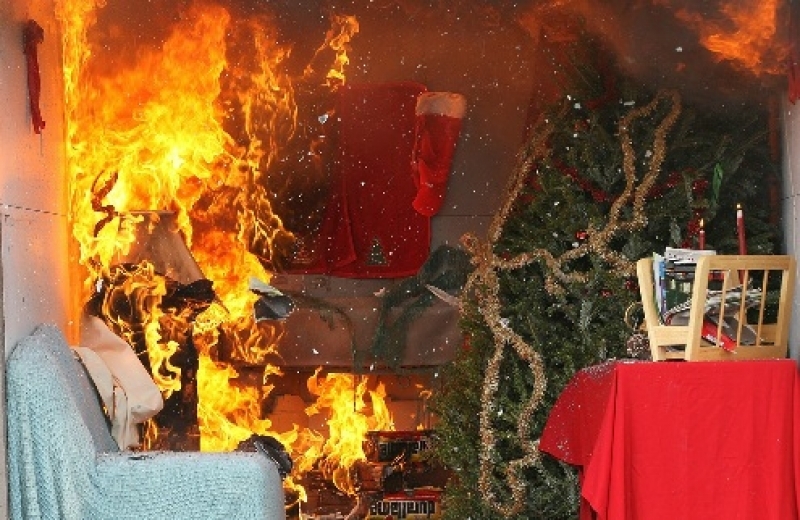 Please keep fire safety in mind during the holiday season, fires in the home are devastating enough any time of year but are especially tragic during the Christmas Holidays.